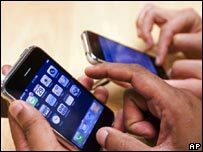 Staff at the UK's biggest mobile phone retailer, Carphone Warehouse, have been caught misleading customers about Apple's popular iPhone handset. Undercover researchers from BBC One's Watchdog found staff made false claims about what would happen if a phone was stolen and had not been insured. This was in the hope customers would take out the store's own insurance. The firm said there could be "some element of confusion among an isolated number of sales consultants". But Carphone Warehouse added it did not believe that the "small number of complaints" were "a fair reflection of the experience of thousands of iPhone customers who have received insurance advice in our stores". The findings come just a year after Carphone Warehouse was fined £245,000 by the Financial Services Authority for breaking the rules on selling insurance. Viewers complained to Watchdog that they had been told if they lost their iPhone, they would have to buy an entirely new 18 month contract - at a minimum cost of £630. But that is not true. Customers would have to buy a new handset but the contract itself would continue. In three out of five stores visited by Watchdog, researchers were told the same. And at one store, they were also told insurance offered by O2 shops - the only other UK mobile retailer authorised to sell the iPhone - would not offer as much cover as theirs, which again was untrue. Staff at the stores receive commission on all insurance and phones they sell. This report will be shown in the latest edition of Watchdog on Wednesday, 28 November, at 8.00pm on BBC One. Are your fingers about to replace the mouse and keyboard?